Located in Bowling Green, Kentucky, the Aviation Heritage Park was created to recognize achievements by local aviators and to educate future generations about the stories and importance of South Central Kentucky to aviation history. AJRC produced the original master plan for the park which was designed and built as a large circular form to instantly create a sense of a visually-completed space but allows for future aircraft to be easily added. Currently there are five aircraft on display, including the Phantom 550, flown in the Vietnam War by General Dan Cherry. As part of the original master plan and the park’s desire for providing more educational programs and displays, a museum is being planned. 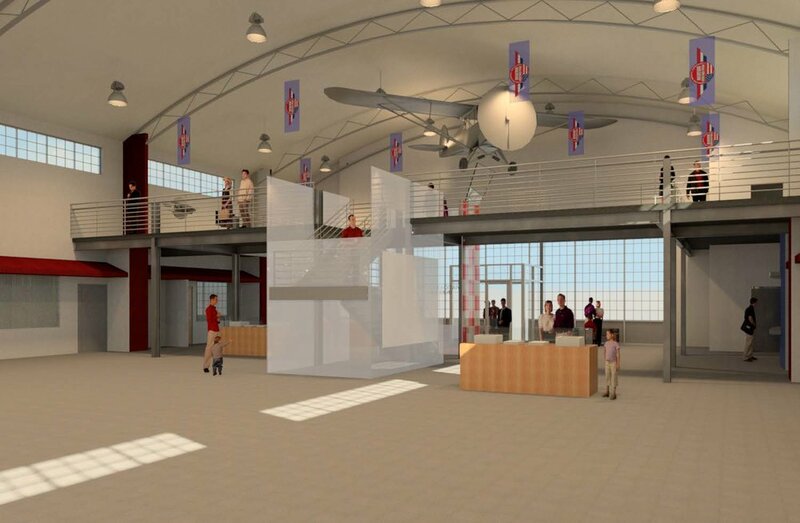 AJRC has developed schematic design drawings for a new 11,000-SF structure evoking the desired art deco style of WWII era hangars. The museum is planned to provide display space, classrooms, offices, and a workshop for maintenance. The Aviation Heritage Park exists because of the continued financial support of people like you. We appreciate how you help us honor our region’s heroes. Please consider making a donation. Click here to donate now!